In the US bum has various meanings, the main one being, ‘a lazy person.’ However, in such far-flung corners of the world as the UK (where I’m from) and Australia, bum is primarily slang for the buttocks. The Chinese characters on the sign say 包子 baozi, which is actually a type of steamed bun, stuffed full of yummy fillings. 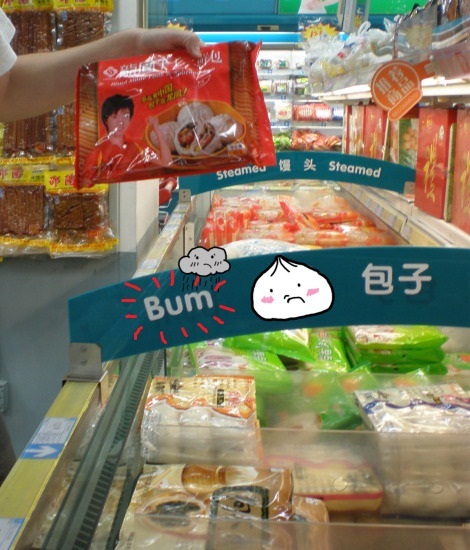 I can only assume that the intended word for the sign in this Chinese supermarket was actually bun, as opposed to bum… I wonder if the sign is still there. What are some of the best Engrish mistakes you’ve ever seen?